Several readers have asked me to tell you more about the Cat Cabin, so I will. I don't know a whole lot about it, but a quick phone call to the grandson of the previous owners of our farm (who also happens to be the Donkey Peddling Cowboy) confirmed my suspicions as to its original purpose. He said he didn't know for sure, but it was most likely used as a smokehouse or for storing corn. "I never saw Grandma smoke any meats or anything in it, but that's what she always called it--The Smokehouse." At one time there were 40 families living down in this little valley. There was a large sawmill and even a school. Part of our house (which is over 100 years old) was the general store, so it would make perfect sense to have a smokehouse next to it. All of the houses except ours are long gone--most were destroyed by flood. The Cat Cabin is just a few steps from the house so it, too, has survived. But as you can see, I wasn't kidding before when I said it was literally sinking into the ground. 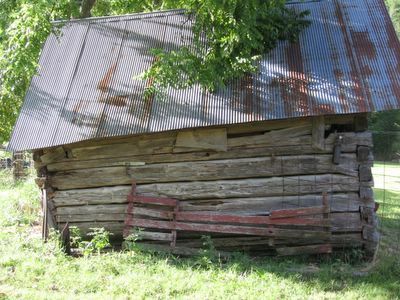 This historic little structure, which is 'decorated' on the outside with aged odds and ends, now serves as a storage space and (as its current name implies) home to New Cat and J2 (who are the best of friends). They absolutely love their cabin and spend much of their time in it. It has shelves to climb around on, conveniently placed perches from which to safely survey the world, a dining spot high above dog level, and even a cozy wool bed. So there's the story of the Cat Cabin. If I find out anything more about it, I'll let you know. I also have a few more photos of it that I hope to get around to posting, including a close-up of one of the corners. The construction is truly amazing. As for my investigative phone call to the cowboy grandson--well, the subject of donkeys also came up, but that part of the conversation will have to wait for another time. Your reasoning for naming New Cat as you did is great. He is truly a new cat with each changing season. Wonder how he can be both longhaired & shorthaired? My three longhaired cats stay that way all summer, and just get matted. They're so pitiful in the Georgia heat. I come back to your blog when I want to escape for a few minutes. Your writing AND your pictures are great. I did a quick sketch of the cat/smoke house. Take a peek if you want. I'd love to add your blog to my list of links. That cool? Take care and say hi to Dan for me. He looks like a pal. I have to admit, I'm dying to see what your house looks like. It sounds amazing - everytime you mention it, I get a different idea of what it might look like. Great photo of the Cat Cabin. I love those old country buildings too. Another new fan here. I so enjoy your blog. Makes me miss the farm. Just wanted you to know how much you brighten my day. Yep, LBH and I could definitely fit in to the cat cabin quite comfortably. Boo would eventually get used to the other cats. We'll hop on the first flight! Thanks for telling us about the Cat Cabin! And the "Donkey Peddling Cowboy" hee! I'm another lover of the old collapsing farm buildings. There's something very compelling about them. Another WOW! You really have our curiousity up...just like your cats. I guess I mention the novel too much, but you have so much material right under your feet...literally. Just think of what you might find if you had a metal detector to unearth "what lies beneath." It gets "curiouser and curiouser," to quote Ray Bradbury. I don't know how I missed this post. I'm the one who asked you about the Cat Cabin not too long ago. Thank you for posting about it and about exactly who lives there! I love old structures like this. It reminds me of something from my favorite show as a kid, Little House on the Prarie. Kudos to you for saving it. And about that donkey conversation... does this mean there are baby donkeys in your future? On my dad's farm we have a smokehouse and summer kitchen, and this is where the cats stay. When I was growing up, the cats were my only friends for miles. Every spring would bring new friends. OUr "cat cabin" is falling down too. I love your blog, especially the landscape photos (which make me long for a lovely summer farm evening with a minty iced tea on the porch. I don't know if that's really what happens on farms in the evenings, but it's what I like to imagine!) and the photos of your lovely animals. Thanks so much for sharing your farm with us!